The oil and gas industry is an exciting and dynamic one in which to work. As the search for hydrocarbon deposits throughout the world moves into ever-increasing water depths, there is a growing demand for technological solutions to complex engineering challenges. Exploration in water depths down to 3,000m (approaching 2 miles) is ongoing in several locations. The challenges are further compounded by the very harsh environmental loadings imposed by wind, waves and currents frequently encountered in these areas and which offshore structures must withstand over their design life. The design of deepwater offshore structures and systems requires sophisticated analysis, rather than reliance on code-based procedures. The working environment for the engineer is always intellectually challenging, and each project involves new and leading edge technologies. Innovation rather than mundane or repetitive work is the norm. Typical capital costs associated with large deepwater field developments are very large, often in the range US$2.0bn - US$3.0bn. A key factor in reducing costs is to develop better technology, and the role of the professional engineer is central to achieving this. The offshore sector is exciting for Ireland, as it is widely predicted that the first Irish oil will flow within the first decade of the new millennium. contractors, the majority of which are located outside Ireland. The company has worked on offshore field developments in the North Sea (UK and Norwegian sectors), Atlantic margins (offshore Scotland), US Gulf of Mexico, Australia, Brazil, west of Africa, Far East, the Mediterranean, Argentina, and on feasibility studies for fields offshore Ireland. The multidisciplinary nature of the work means that staff come from backgrounds such as civil engineering, mechanical engineering, naval architecture and software / IT. All hold higher honours primary degrees, and most have postgraduate qualifications. 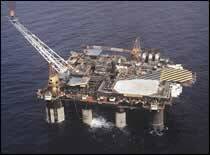 The Corrib Gas Field, located in the Slyne Trough 70 km off the North Mayo coast, was discovered in 1996. By Year 2000 a third successful test had been carried out on the gas field. Initial indications suggest that the Corrib gas is high quality, dry and free of contaminates. Enterprise Energy Ireland Ltd., will approve commencement on the development of the field. It is forecast that production could commence in early 2003 and that the field could supply around 60 to 70% of Ireland's gas demand by 2005. The field is of significance for Ireland as the Kinsale Head, the country's first major gas field, is due to cease production in late 2003 or early 2004. The Corrib Gas Field Project will involve major engineering works including sub sea structures, subsea pipeline, on shore facilities and gas pipelines to connect to the national grid.